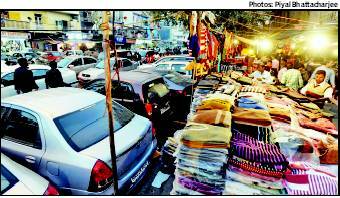 New Delhi: In Karol Bagh market, shoppers walk on roads as street vendors have taken over the pavements. While the vendors claim they are licensed to operate, North Delhi Municipal Corporation says it has issued t e h b a z a a r i s to only 340 people and the rest are operating illegally. Traders say the number of street vendors has increased manifold over the years due to lax enforcement. “Street vendors outnumber the shopkeepers here. It has not only affected out business but also left no space to walk,’’ said Murli Mani, president of Karol Bagh Traders’ Association. Sources say there are 1,000-1,200 t e h b a z a a r i sin this area. And the corporation is yet to draft a policy to regulate street vendors. The vendors’ association, however, claims all the t e h b a z a a r i s are authorized. “Some of us have t e hb a z a a r i licences while the others have applied for them. The corporation has been sitting on this issue for years now,’’ said Devendra Kohli, a street vendor and member of the vendors’ association. Mahinder Nagpal, leader of the house, North Corporation, said, “We have drafted a policy for street vendors and will soon approve it. We will identify new sites for them”. While the corporation claims that a new policy is in place, vendors say they don’t want to move out. “The corporation had allotted new sites to some of us, but these were not in the market area. How will we earn our livelihood if we are removed from the market?’’ said Kohli.